Fantastic Flatbreads. Super thin flatbreads are gaining popularity in restaurants and at home. 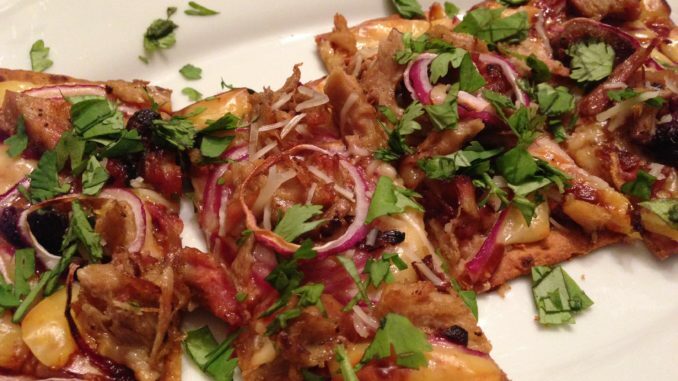 For an easy weeknight meal, top a flatbread with your favorite ingredients and bake it. Seasons 52 is a national restaurant chain that changes its menu with the seasons. I have dined there a few times. My most memorable lunch was a Braised Short Rib and Aged Cheddar Flatbread. It was garnished with pickled red onion, horseradish sour cream, and micro cilantro. A very tasty and fairly light lunch! 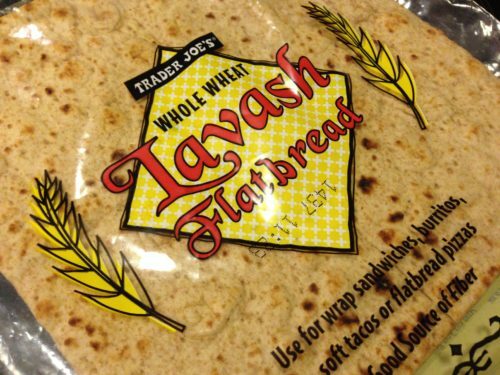 I like to use the whole wheat Lavash flatbreads that Trader Joe’s sells. They also freeze well so you can buy them in bulk. Feel free to use your favorite flatbreads. Below is a list of some of my favorite flatbreads. We love to make several flatbreads with different toppings for variety and share our slices. It’s a simple meal and great for kids who want to help in the kitchen. What’s your favorite combo for a flatbread? Ingredients are listed in order of assembly on top of flatbreads, so first ingredient is the base item. 1. Veggie Blanco Flatbread: Ricotta cheese, sauteed mushrooms and onions with garlic, minced fresh oregano, goat cheese crumbles. Garnish with a bit more minced fresh oregano after baking. 2. Garden Veggie Flatbread: Shredded mozzarella, sliced ripe tomato, sauteed sliced zucchini, caramelized onions, garlic, pine nuts. Sprinkle with shredded Parmesan cheese after baking. 3. 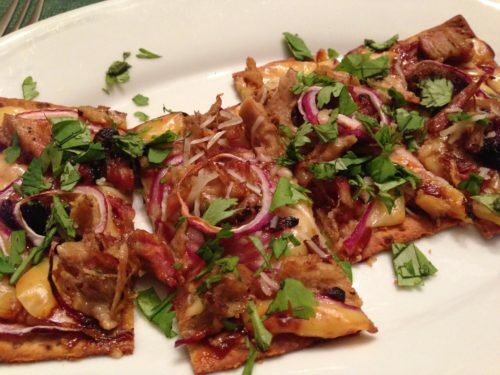 BBQ Pork Flatbread: BBQ sauce, shredded smoked Gouda cheese, shredded Mozzarella cheese, thinly sliced purple onion, shredded smoked pork. Garnish with chopped fresh cilantro after baking. 4. 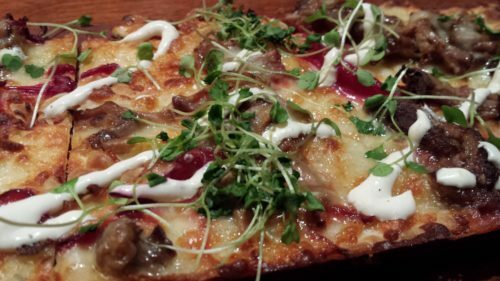 Asian-inspired Flatbread: Hoison sauce, shredded Mozzarella cheese, pulled smoked duck, thinly sliced shallots and Shiitake mushrooms. Garnish with chopped fresh cilantro after baking. 5. Tex-Mex Flatbread: Refried beans, shredded cheddar cheese, taco-seasoned ground meat, diced tomato, shredded Monterey Jack cheese. Drizzle with your favorite salsa or taco sauce and sprinkle with chopped fresh cilantro after baking. 6. Italian Caprese Flatbread: Ricotta cheese, pesto, sliced ripe tomato, mini Mozzarella balls. Drizzle with Balsamic Vinegar Syrup and garnish with chopped fresh basil leaves after baking. 7. Smoked Salmon Flatbread: Creme fraiche, shredded mozzarella cheese, thinly sliced shallots. 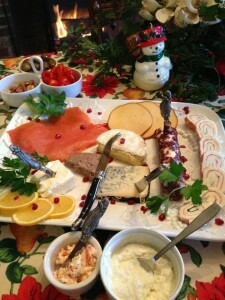 Add thinly sliced smoked salmon strips and garnish with fresh dill sprigs after baking. 8. 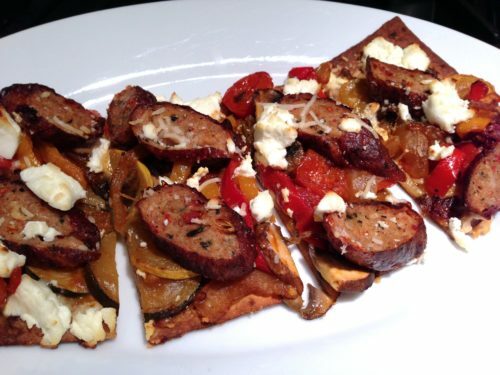 Smoky Vegetable Sausage Flatbread: Shredded mozzarella cheese, smoky vegetable ragout, sliced cooked Italian Sausage. Top with shredded Parmesan and chopped fresh parsley after baking. 9. Mushroom Medley Flatbread: Fresh ricotta cheese, shredded Mozzarella cheese, sauteed Cremini, Portobello and Shiitake mushrooms with garlic, chopped fresh oregano. Top with shredded Parmesan and more chopped fresh oregano after baking. 10. Zucchini Tomato Flatbread: Shredded mozzarella cheese, shredded Havarti cheese, thinly sliced ripe tomato, lightly sauteed zucchini slices with garlic. Top with toasted pine nuts and chopped fresh basil after baking. 11. Broccoli Ham Flatbread: Fresh ricotta, finely chopped broccoli, diced ham, shredded mozzarella. Top with shredded Parmesan after baking. 12. Garlicky Tomato Mozzarella Mushroom Flatbread: Roasted tomato sauce, shredded mozzarella cheese, sliced garlic, thinly sliced tomatoes and mushrooms. Garnish with a drizzle of balsamic syrup, shredded parmesan and thinly sliced basil leaves after baking. 13. Kid’s Favorite Breakfast Flatbread: Bake the flatbread until golden brown and slightly crispy. Then add a slather of almond butter or peanut butter. Top with sliced strawberries, sliced banana, and raisins. Sprinkle with grated coconut. Garnish with a dash of cinnamon and powdered sugar. 14. Eggy Breakfast Flatbread: Shredded Swiss cheese, freshly cracked eggs, crumbled cooked bacon. Bake until egg is set and flatbread is golden brown. Top with chopped fresh parsley after baking. 15. Avocado Apple Breakfast Flatbread: Bake the flatbread until golden brown and slightly crispy. Add mashed avocado, apple slices, arugula, and a drizzle of honey. Garnish with chopped toasted pistachios and a dash of chili powder. 16. Chocolatey Berry Dessert Flatbread: Bake the flatbread until golden brown and slightly crispy. Spread fresh ricotta onto the baked flatbread. Top with sliced strawberries and a handful of blueberries. Garnish with a drizzle of chocolate syrup and chopped fresh mint leaves. Method: Preheat your oven to 350 degrees Fahrenheit. Place your flatbread(s) on a parchment paper-lined baking sheet. Top the flatbread(s) with your favorite toppings. Bake the flatbread(s) for 10 – 15 minutes until the cheese is melty and the flatbread is crispy. If you are baking a plain flatbread for topping later, just bake for 5 minutes until golden brown and slightly crispy. 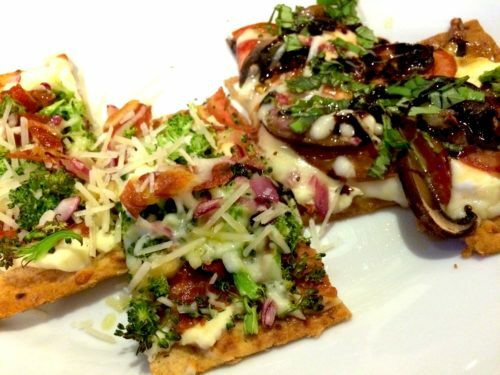 Cut your flatbread(s) into slices, garnish with additional toppings, and divide amongst serving plates! Serve with a side salad or bowl of soup. Variations: Unlimited! Go for it!